METUCHEN, N.J. – It’s another usy weekend in the East Conference of United Women’s Soccer as another slate of six games are scheduled. All five teams at the top of the conference will be in action with two teams – New Jersey and New England – facing a tough two-game road trip. On the other end of the spectrum, Western New York and Rochester host those two teams and may very well upset the conference race in their efforts to gain their first victories of the season. East leaders Long Island will travel to face a two-loss Lancaster team that have proven to be just as dangerous as the Rough Riders themselves. 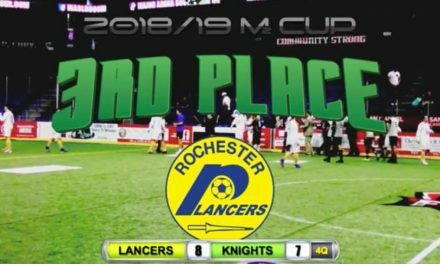 After a rough opening weekend to their first season in UWS, the Rochester Lady Lancers (0-3-1 East) have been able to develop into a much more competitive side over the last two games – drawing 1-1 against the New York Magic and losing 2-0 to conference leaders Long Island. Playing at home has most assuredly helped that turnaround. 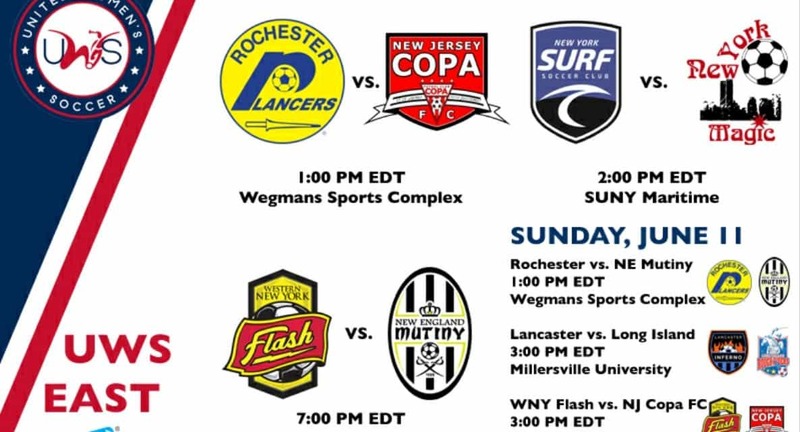 Yet, they still have not notched a win and that prospect will be an even more difficult one as the defending East champions New Jersey Copa FC (2-1 East) come to town in the first of two more home games at Wegmans Sports Complex for Rochester this weekend. It was Copa who gave the Lady Lancers a eye-opening welcome to the national pro-am league on Saturday, May 3rd. NJCFC hosted Rochester on a rainy & windy night at Saint John Vianney High School, and dominated possession in a 6-0 win. Five different players tallied goals for New Jersey and young midfielder Katarina Nilsson (two goals) was tabbed the Jersey Mike’s Subs Woman of the Match. Forward Lauren Mazich notched the game-winner in the 29th minute on an assist from 2016 All-UWS selection Jackie Bruno. It would be the first of several games this season where Lady Lancers goalkeeper Caitie Broderick bore the brunt of the loss, making five saves. The first-ever derby between the two New York City-based teams kicks off on Saturday afternoon, as the New York Magic (0-2-1 East) travel north from Brooklyn to the Bronx to take on the New York Surf (2-1-1 East) at SUNY Maritime. The Surf have had a rock solid start to their first-ever UWS campaign while the long-standing Magic organization is still looking for their first-ever victory in the national pro-am league. The Magic have now gone 13 UWS East matches without a win but there is no better time to break that unlucky number than the commencement of an in-city rivalry. They almost broke that streak in their last match this past Sunday night at home against New England, but it took a strong performance from UWS Team of the Week selection Gabby Arruda in goal to fend off the Magic’s strong start. A late goal on a defensive lapse doomed the Magic in the 1-0 loss. The Surf would also feel the sting of loss last Sunday, dropping their first verdict of the campaign on the road at Lancaster. The Inferno held on for the 2-1 win after a late rally from the visitors. After giving up the first two goals, the Surf gained control of play and in the 71st minute, forward Erica Murphy capitalized on a rebound from a Flo Gamby shot. The last time the Western New York Flash (0-2-2 East) and the New England Mutiny (3-1 East) met on the pitch, it was the 2012 WPSL Elite season. 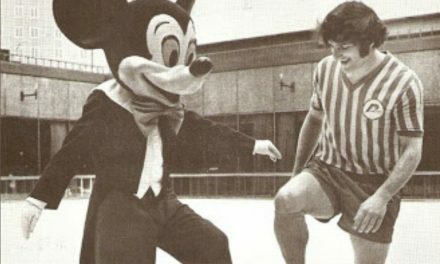 After the dissolution of Women’s Professional Soccer (WPS), the one-year pro-am experiment would never re-materialize but it did bring together professional organizations like the Flash and top-class amateur sides like the Mutiny. The two sides battled to a tense 3-3 draw on Sunday, June 24th with WNY being led by Spanish star Adriana & USWNT defender Meghan Klingenberg while New England had current team captain Kate Howarth & Boston Breakers midfielder Morgan Andrews scoring for the home side. It has not been a smooth start to the Flash’s first season in the UWS East, especially after last Saturday’s humbling home defeat to conference leaders Long Island. Western New York are in the midst of a five-game homestand and have yet to register a win this year. Two home matches this weekend against two of the top teams in the conference will certainly be a tough test but it might be a great time to catch the Mutiny. New England has struggled on the road recently and it took a late game-winning goal from Lauren Aldrich last Sunday for the Mutiny to defeat the win-less New York Magic by a 1-0 score. It will be a tight turnaround for New England after Saturday night’s game in Buffalo and their roster depth in Sunday’s rematch against Rochester will most certainly be tested. Both teams will have two games in two days but the road has not been a friend to the Mutiny recently, as they had an arduous task last weekend in New York City. The good news for New England is that a transfusion of new blood into the lineup has helped spark life into the team. Newcomers Lauren Aldrich and Gabby Arruda were key in last Sunday’s win. After missing action in the last two road games, the Mutiny hope to have youngster Abby Sotomayor and veteran Riley Houle back in the team’s attack. Rochester has steadily built themselves up since their 5-1 loss to New England on Sunday, May 14th. In their last two games at home, standout goalkeeper Caitie Broderick has done enough to keep the Lady Lancers in the games while the offense has had their chances, but have yet to capitalize. In the draw against the Magic, forward Taylor Wingerden had a chance for the team’s first win but her penalty kick was saved in second half stoppage time. After some early scoring chances last Sunday against Long Island, those squandered opportunities came back to haunt them in a 2-0 loss. The Western New York Flash have been a powerhouse in the regional soccer scene and will meet an up-an-coming organization in the East in New Jersey Copa FC. Both organizations share a strong youth system and many of their alumni will be on showcase in Sunday’s first-ever match between the two teams. They will need that roster depth as both teams face two games in two days. But at this point in time, the up-and-comers appear to be heading in a upward trajectory while the long-standing side has had its confidence shaken up. After their first regular season loss since their 2016 opener, New Jersey continued their unbeaten streak at home last Saturday with a 2-0 win over Lancaster. Unassisted strikes from Camille Bowen in the 18th minute and an insurance goal from Katarina Nilsson in the 73rd combined with the defense to post a clean sheet for the second time this year. While not victorious, WNY were in every match they played in up to last Saturday’s 7-0 loss to Long Island. The Flash came back to tie Long Island in their 2017 opener on the road and did that much better on May 20th, tallying two late goals in a 2-2 draw with the New York Surf. Sunday’s game between Lancaster and Long Island will be the first time they’ve met this season, after splitting the home-and-home series during the 2016 regular season. The Inferno got the 1-0 road win over the Rough Riders last June 5th while Long Island reversed the result on June 19th, getting the 2-1 victory at Pucillo Field. Lancaster (2-2 East) came away with their second win of the season last Sunday against the New York Surf in their 2017 home opener, holding on for a 2-1 win. Midfielder Tesa McKibben (goal) and forward Emily Kupsov (goal, assist) led the offense while the combination of Jordan Kamp and Kelly O’Brien made nine saves in goal. But this season, Long Island (3-0-1 East) have been virtually unstoppable since their 1-1 home draw against Western New York to open the campaign. In their last three wins, the first-place Rough Riders have outscored their opposition by a 12-0 margin. Last weekend, forwards Morgan Santoro and Kayla Saager were dominant in wins over Western New York and Rochester, tallying seven goals between the two of them. Santoro was named to the UWS Team of the Week for the second time this season and has two game-winning goals for her efforts. But if their offense has been electric, their defense has been well-grounded with three straight shutouts.